A coalition of Conservative, Liberal Democrats and independent councillors will run Aberdeenshire Council. Conservative Jim Gifford was elected council leader by 38 votes to 25 against the SNP's Richard Thomson. Lib Dem councillor Peter Argyle was appointed deputy leader at Thursday morning's meeting. 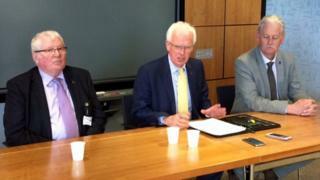 Fellow Lib Dem Bill Howatson was elected Provost, with Conservative Ron McKail taking on the deputy provost role. In the local elections in Aberdeenshire, the Conservatives had 23 seats, up from 14, while the SNP fell eight to 21. The Lib Dems gained two to 14, independents fell from 12 to 10, and Labour dropped from two to one. In Shetland, independent Cecil Smith - who has served on the council since 2007 - is the council's new leader. Shetland Islands Councils remained in the control of independents.